Along with horror and shooters, the other genre that has benefited most from PlayStation VR this far are puzzle games. Even the most simple experiences gain a whole new layer of immersion and engagement when viewed through virtual reality. Symphony of the Machine is a new puzzle game for PlayStation VR where you manipulate ancient machines in a gargantuan tower to manipulate the weather and bring life back to a barren world. Does this game end on a high note, or is it woefully out of tune? Time to find out! There not much story at all in Symphony of the Machine, but you can deduce some things from the game's world. For starters, you are on a planet not unlike the rocky surface of mars by way of Earth's Montana. 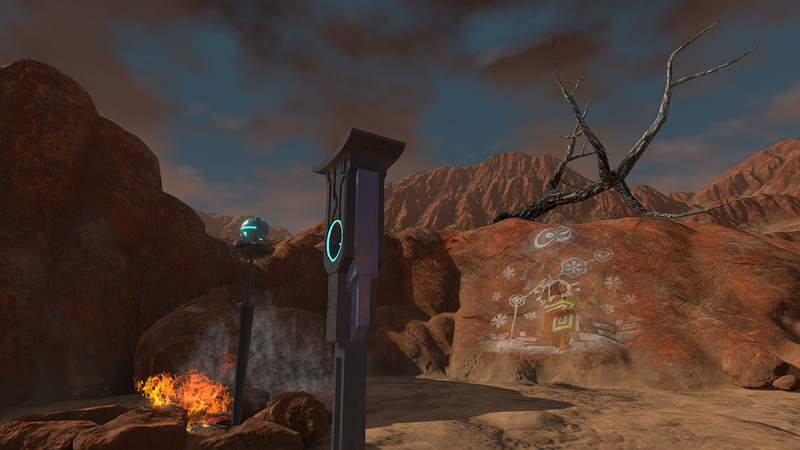 One of your first sights, is a glyph painted on a stone wall that hints at the purpose of the tower in the distance. You'll make your way across the surface and ride an elevator to the top of this mysterious tower. Once you arrive, a tiny robot whirs to life and your purpose becomes clear through its beeps and floating holograms. It brings you seeds and soil to plant them in. The glyphs that hang above you and all around you all show conditions like sun, clouds, wind, and rain. The robot displays a hologram showing a combination of weather patterns, and your journey begins. Now, all of this makes for a cool first impression, but the game doesn't really develop the story from there. Even something as simple as narration between each successful plant you grow, would have gone a long way towards making the progression feel tactile and satisfying. As it stands, the only story you get, is the one you make as you progress through the various plants. When the credits roll after about an hour or two, a sandbox mode (included in the day-one patch) gives you an endless mode to manipulate the weather and continue playing to see how you can affect this strange world. So, not a whole lot of story here, which is a missed opportunity, given the unique world and art style. Let's see how the gameplay fares. Symphony of the Machine makes a great impression with its gameplay. While the point-and-click style of movement, combined with the staggered turning isn't ideal, it does work well for those who are prone to motion sickness. These mechanics all work fine. The game can also be played with the DualShock or the PlayStation Move controllers. I highly recommend that you use Move if you have it, but this comes with a high price: you're going to need a lot of space. Thankfully, I have a lot of space to work with (if I push my couch to the back of the living room). I placed my camera on top of the TV and gave Symphony of the Machine the best conditions a VR game could ask for. For about 70% of the time, the game worked really well. 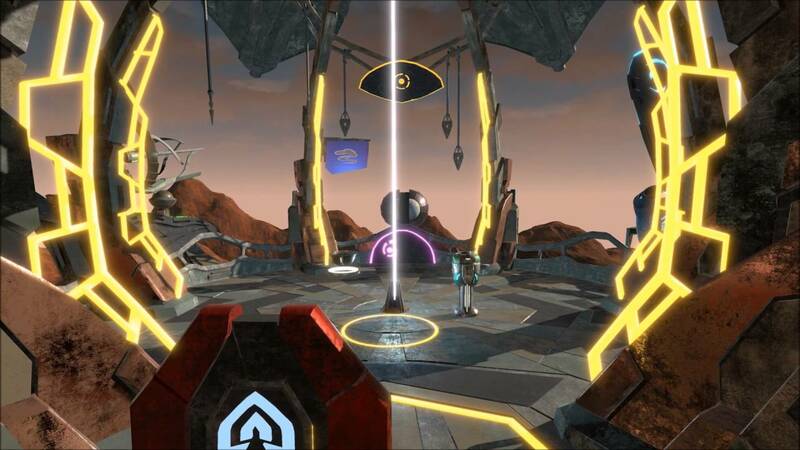 The puzzles involve using tools like futuristic mirror panels, splitters, and modifiers to direct a laser in the center of the room into the glyphs surrounding you. Your robot companion will show you which weather conditions a plant needs to grow. Sometime it will be sunny with wind, and other time it will be sun, wind, and rain. As you connect the laser to the glyphs, new barrier appear based on which element is being used. As modifiers (such as ice to make snow) are introduced, new barriers are introduced as well. This requires you to get creative with your tools. At times, I would have to reach up incredibly high to create a horizontal split in the laser so I could bounce the laser off of a panel that went over a barrier and down into the glyph. Other times, I would find myself zig-zagging the lasers around the platform in the top of the tower, trying to create some complicated solution that would suit my needs. All of these things were really fun and very engaging. Watching the tower's machines come to life and change the weather all around me never got old in VR. Of course, even in perfect weather, Symphony of the Machine wasn't a perfect experience. It's worth mentioning that a good chunk of these issues are a result of the PlayStation VR's one camera tracking system, but perhaps a better system could have been implemented to prevent the issues I came across. Despite the conditions I created, I would lose tracking on the Move controllers fairly consistently, especially when a puzzle required me to reach high or low. Far more annoying, were the times I would be carrying an object in my hand, and lose tracking because I reached too high or turned too far. In these situations, the object returns to its last location. Far too often, this location was across the play area, forcing me to teleport all the way back to get it. A better solution, would have been to just leave the object where I had it. I found that dropping/picking it up more consistently would result in less backtracking when the Move controller disappeared, but it didn't stop frustration from setting in. All of the turning and moving in Symphony of the Machine also meant that I would find myself moving away from the camera's view in the real world and walking too far to the side of my living room. It was a slow, but constant problem that comes from the fact that PlayStation VR isn't ideal for room-scale experiences. It was usually easier for me to physically move, then to wait on the staggered turning or teleportation systems. Here, an option for smoother movement would have helped. My only other complaint, is the robot helper. While fairly smart for the most part, it likes to sometimes run away from you when you're trying to take an item it has. Furthermore, it would often sit inside of my lasers, interrupting the connection and halting my progress until it moved. It wasn't a constant problem, but it happened enough to make it worth mentioning here. Things like a tractor beam when you hold down the grab button can help remedy issues like these when items are out of reach, but it doesn't completely solve the issues. While there's only a couple hours of gameplay to main portion of the game, the sandbox mode does add an a lot of replayability for those who want to explore and experiment. If there's one thing Symphony of the Machine isn't slouching in, it's the graphics department. I played the game on PS4 Pro in VR, and it was stunning. The texture of the crimson stone and the gray concrete of the ancient tower are all extremely detailed in VR. The weather affects are pretty convincing as well, and something that wouldn't have anywhere near the same impact on a standard screen. Beyond this, the graphics are simple, but everything is extremely crisp and believable with the headset on. I like the concept that Symphony of the Machine puts forth. I would have loved a serene and profound story to match its mysterious world and weather manipulation. I also wish the gameplay was a little more polished and the tracking more consistent. At $19.99, there's a cool concept here for VR puzzle fans, but you'll need to get your setup just right for the best experience, and even then, this symphony can hit a few sour notes. That being said, if you've got the space and the patience to deal with some nagging issues, it still hits some high notes in the main game and the sandbox modes.